ANNUAL RAINFALL: Varies from 170 in. (4,300 mm) at the coast to 80 in. (2,000 mm) 125 miles (200 km) inland. GOVERNMENT: Independence from France, 1958. President elected by universal suffrage. Governing bodies: 114-member Assemblée Nationale and Council of Ministers. The Republic of Guinea is a crescent-shaped country on the coast of West Africa that consists of several distinct regions. First unified under French colonial rule, Guinea’s regions vary greatly in terms of geography, ethnicity, and religion. The regional differences have presented problems for the country in both colonial and modern times. The four regions of Guinea—lower, central, upper, and southeast—have well-defined natural borders. Lower Guinea, the region along the coast, is dominated by plains and crisscrossed by several rivers and many smaller tributaries. Its hot, humid climate is well suited to agriculture. 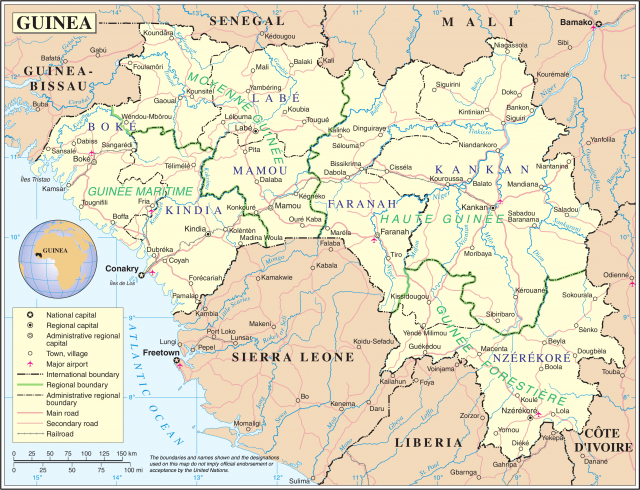 Inland is the mountainous region of central Guinea. Its peaks rise to a height of 5,000 feet. Although less favorable for farming, central Guinea is the most densely populated portion of the country. Upper Guinea, located in the northwest, is marked by a series of plateaus that are divided by the NIGER RIVER. Forests cover southeast Guinea, which is higher and more rugged than the other regions. Before the arrival of Europeans, the inland regions of Guinea were the sites of frequent warfare. Local chiefs and Islamic rulers from the southern SAHARA DESERT raided the area for slaves. These disturbances drove many people to the coastal region. The empire of Futa Jalon controlled communities along the coast, and Islamic states ruled the highlands. The forest region was divided into many small political units. In the mid-1800s France established three military posts in the region. After founding the city of CONAKRY in 1880, the French received official recognition in Europe of their claims to Guinea. Over the next 20 years, they conquered most of the remainder of Guinea, defeating Futa Jalon in 1896. The forest region proved more difficult to subdue and was under military occupation until 1912. As elsewhere in Africa, the French sought to exploit Guinea’s natural wealth. The colonists tried several cash crops, including peanuts, rubber, and bananas. Guinean rubber was in great demand during the early 1900s. However, competition from rubber plantations in Asia led to the collapse of the market by 1913. Bananas, introduced in the 1930s, dominated Guinea’s colonial economy for 20 years until a leaf disease devastated the crop. Rich deposits of iron ore near Conakry were heavily mined during the 1950s. After World War II, France granted its African colonies greater political freedom, including the right to establish local political parties. In 1958 Guinean leader Sékou TOURé told French president Charles de Gaulle that Guinea would prefer “poverty in freedom to opulence in slavery.” The same year, Guinea voted for independence from France, and Touré became the new nation’s first president. Guinea formed ties with the Soviet Union and other communist countries. However, the nation also signed economic agreements with Western countries, including the United States and France. Soon after independence, Touré took steps to eliminate opposition to his rule. He outlawed all political parties except his own, and in time he also brought most of the economy under state control. Touré’s actions prompted almost one million Guineans to leave the country. Upon Touré’s death in 1984, the military took control of Guinea and began to privatize the economy and restore political freedoms. New political parties emerged, and in 1993 Lansana Conté was elected president. His rule has been marked by unrest from within the government, from opposition parties, and from neighboring nations. In 2000 rebel groups from neighboring SIERRA LEONE and LIBERIA attacked Guinea, killing hundreds of civilians and causing tens of thousands more to flee their homes. Guinea is home to over 16 different ethnic groups, most of which practice Islam. The Soso dominate the coastal region, while the FULANI and Tukulor are the largest groups in the highlands. The Malinké people inhabit upper Guinea, an area known for its Muslim schools and scholars. Several ethnic groups are found in the forest region, including the Loma, Kpelle, Manon, Kono, and Kissi. Over half a million refugees from war-torn Sierra Leone and Liberia have also joined Guinea’s population. Guinea’s borders, which were drawn by the French, have separated some cultural groups into different countries. As a result, many of these groups do not identify strongly with the nation of Guinea. Such conflicts between ethnic and national identity have posed a problem for the country’s unity. About three quarters of Guinea’s population work in agriculture. Coffee and bananas are two of the country’s most important cash crops. The fertile coastal plain produces a wide variety of crops, including palms, sugarcane, fruit trees, and rice, while vegetables and other garden crops are grown in central Guinea. Cattle and other livestock are raised in several parts of the country.